Multigrain dinner rolls or buns, perfect with any spread or as dinner rolls. 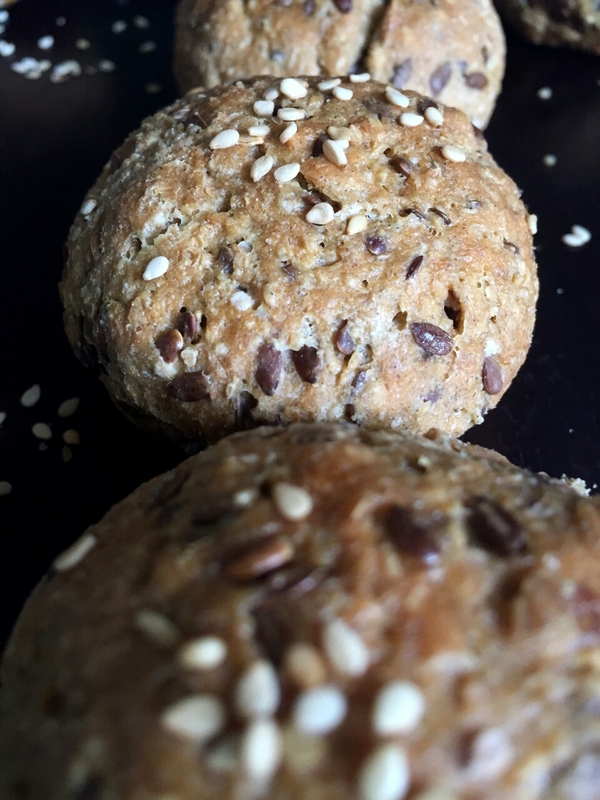 These have been made with whole wheat flour, flax seeds, oats and green gram flour topped with seasame seeds. These buns are eggless, fresh and your home is filled with nice aroma. I like these buns for a quick breakfast with butter and I also love these with my tomato soup side for dinner. I’ve used whole flax seeds in these and have boiled them a little, so there is just right crunchiness in the buns. I had green gram flour at home so I used that for making these buns, if you don’t have one, you can add extra wholewheat flour or wheat bran or any other flour of your choice like millet etc. These dinner rolls or buns are full of fibre. The oats add to the fibre and are very low in saturated fat. 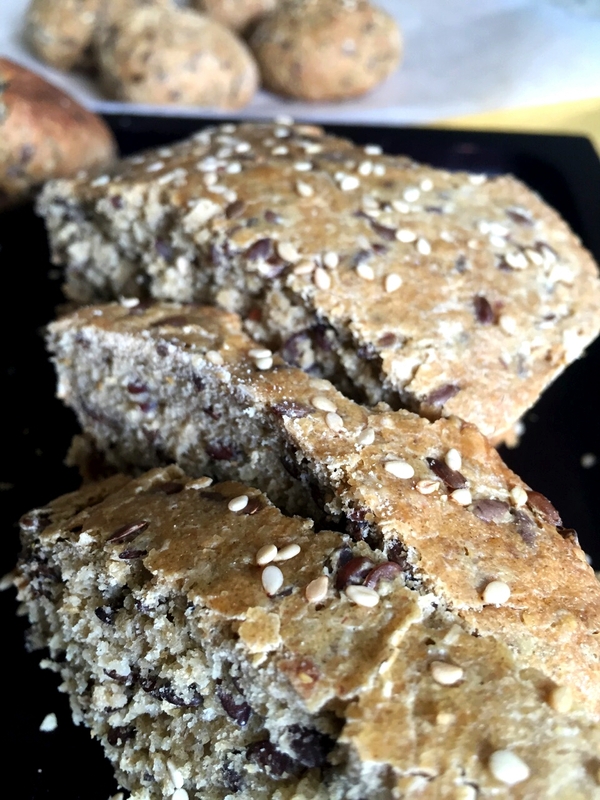 Also, adding flax seeds reduces the glycemic index of the bread and the dinner rolls and thus making it a good option for maintaining a healthy weight. Flax seeds also has high amount of Lignans, thus adding an antioxidant property in addition to increase in fibre. The green gram flour, again is a very good source of fibre and very low in saturated fat, sodium and cholesterol. The goodness of all the healthy ingredients makes this roll a perfect bite for anyone and anytime, free from refined wheat flour. ▪ In a pan boil 3 cups of water and flax seeds and boil for 10-15 minutes. Remove extra water if any and allow it to cool. ▪ In a food processor, add cooled flax seeds, wholewheat flour, green gram flour, oats, salt and activated yeast. ▪ Mix well and add warm milk to make dough. The dough should neither be too tight nor too loose. Grease a big bowl and let the dough to rise for about 90 minutes, covering with a cling film. ▪ The dough would nearly be double in 90 mins. Knead dough again with hands, using little oil and flour. ▪ Make small rolls and spread on greased baking sheet. I also baked a very small bread and about 15 small dinner rolls from this quantity. ▪ Sprinkle seasame seeds on top. Cover tight with cling film and leave for another 45 minutes for second rise. ▪ Brush the buns with milk and bake for 30-35 mintues after the second rise. ▪ Keep a check after almost 30 mintues to make sure they are perfectly baked. 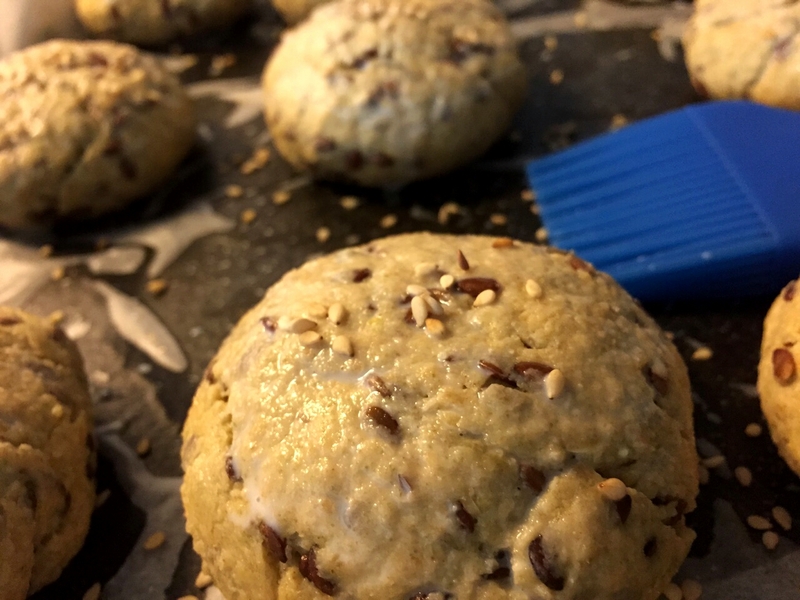 Once done, allow it to cool a little and then enjoy the freshly baked healthy wholewheat roll with your favorite spread or with a soup or just like that, enjoying the crunchiness of the flax seeds! Once cooled, store in an airtight container and avoid keeping in fridge.